The Battle of Hudson Bay occurred over 300 years ago and there hasn’t been a community at York Factory in over 50 years. We are quickly losing the memories and stories of the people that lived and worked in the area. We’ve been conducting phone interviews with as many people as we can to get primary knowledge about the area. Bill spent a lot of time around the York Factory area. In the past 50 years he has found cannon lying on the beech and some large wooden ship pieces. Bill lives in Churchill. 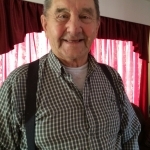 Stan and Marie used to lived in Gillam. Marie grew up at York Factory. 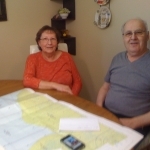 Stan, Marie, and Bill Sandberg know each other and have helped us pinpoint locations where they found remnants of ships. We’ve compared their memories of where they had seen artifacts to our proposed search areas and they align.